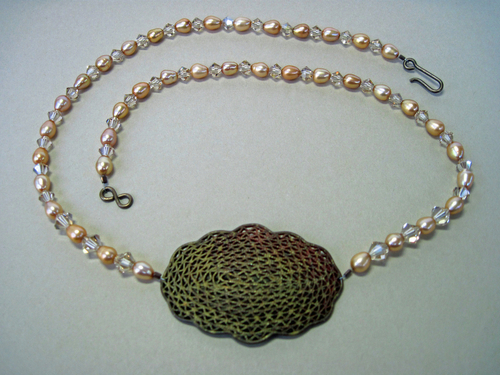 The necklace is made with Swarovski crystals and freshwater pearls and features an antiqued copper centerpiece. It is about 16" long with a "Vintaj" clasp. The necklace is made with freshwater pearls and Swarovski crystals. It features a copper seahorse pendant, which measures about 2x1". It has a copper toggle clasp. Matching earrings are about 2" long with copper ear wires. Priced separately, the necklace is $60 and the earrings are $20. 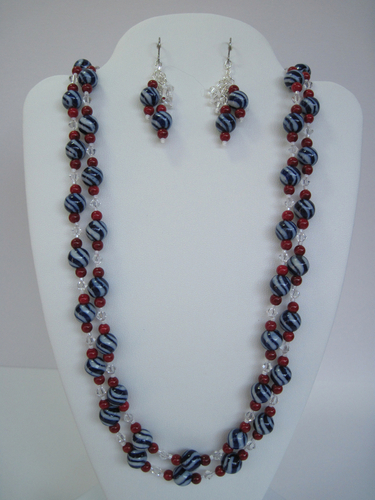 The two-strand necklace is made with porcelain beads and Swarovski crystals. It is about 18.5" long with a silver toggle clasp. Matching earrings are about 2.5" long with surgical steel ear wires. Priced separately, the necklace is $45 and the earrings are $18. 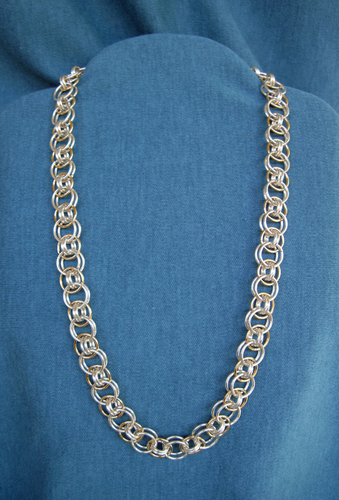 This chain maille set is made with jewelers brass in the helm pattern. The necklace is about 17 inches long with a pewter heart toggle clasp. The earrings are about 1.5 inches long with a gold-plated heart dangle and surgical steel ear wires. The bracelet is about 7.5 inches long with a pewter heart toggle. Priced separately, the necklace is $70, the earrings are $20, and the bracelet is $30. 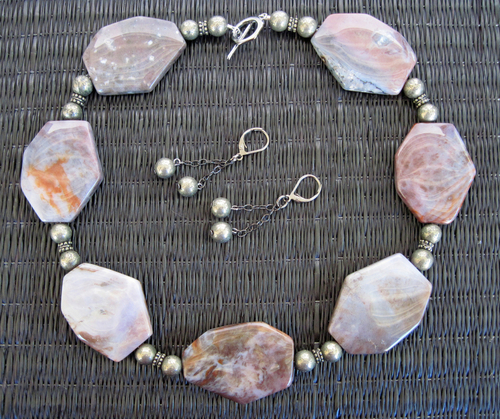 This necklace is made with seven fancy jasper stones in beautiful brown, mauve, and gray colors. Pyrite beads are between the stones. It is about 18.5 inches long and has a gunmetal toggle clasp. Pyrite and gunmetal earrings complete the set. They are about 2 inches long with gunmetal lever back ear wires. Priced separately, the necklace is $70 and the earrings are $18. 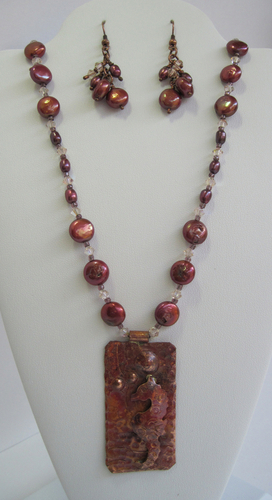 This necklace is made with multi-colored copper loops and lacy beads. It is 44 inches long and has no clasp. 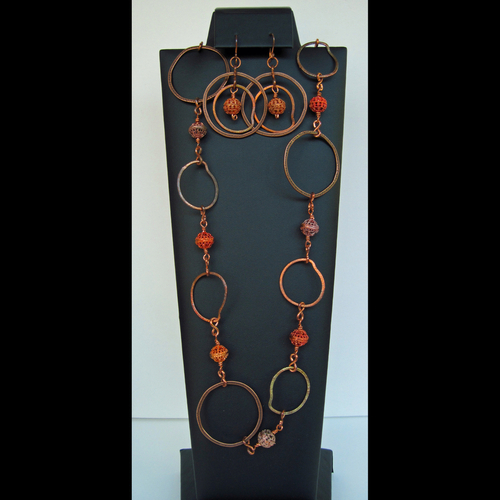 Matching earrings are also made with copper loops and lacy beads. They are 2.5 inches long with copper ear wires. Priced separately, the necklace is $75. The earrings are $30. 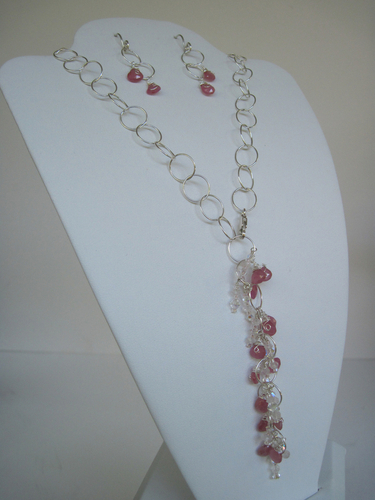 This delicate necklace and earring set is made with about 32 carats of pink sapphire, rose quartz hand-cut stones, and Swarovski crystals. The chain, ear wires, and lobster clasp are all sterling silver. Priced separately, the necklace is $125, and the earrings are $30. 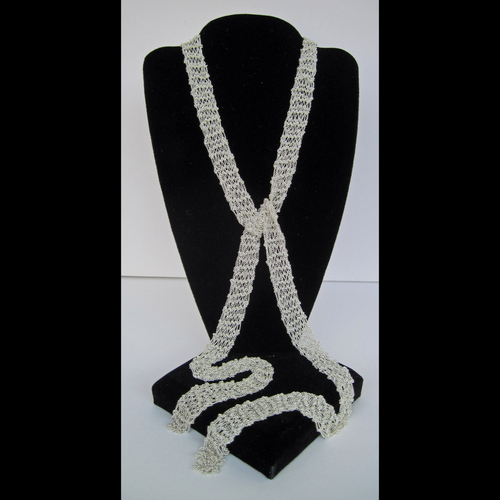 This elegant piece is hand-knit with very fine sterling silver chain. It is 36 inches long. 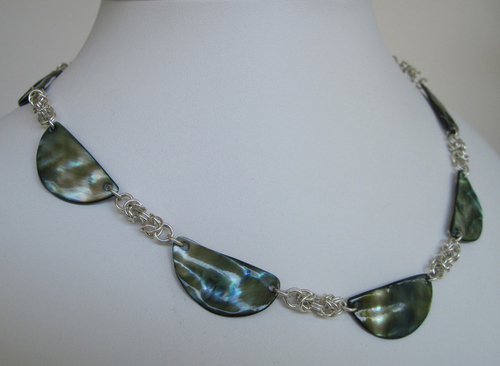 The necklace is made with abalone pieces, which are separated by sterling silver Byzantine chain maille. The necklace is about 17.5" long and has a sterling silver toggle clasp. 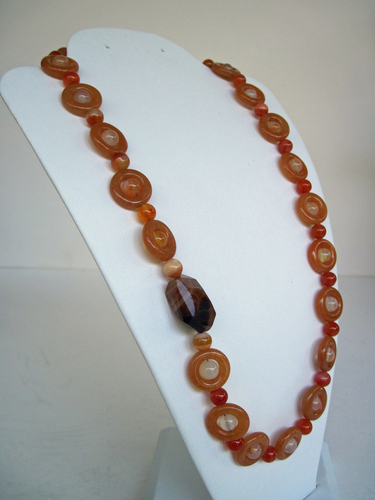 The necklace is made with red aventurine and agate beads with a brandy opal accent. It is about 18.5" long and has a 14K gold-filled hook and eye clasp. The necklace is woven in the 4-in-1 pattern in Sterling Silver. It is 17 inches long and has a sterling silver slide clasp. Matching earrings are Sterling Silver dangles that measure 2.25 inches long. The earrings have Sterling Silver lever backs. 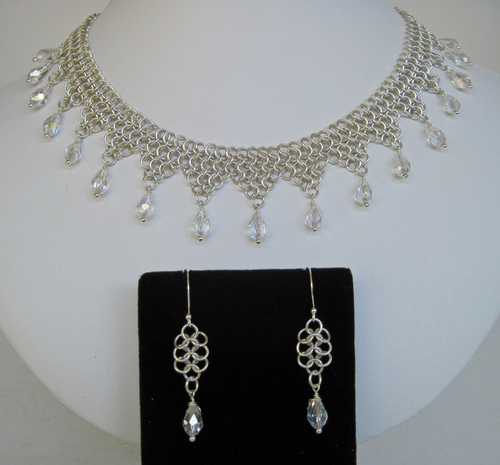 Priced separately, the necklace is $125.00 and the earrings are $25.00. This lariat features Swarovski Crystals in Purple Haze. The 14K gold-filled chain is 38 inches long. Matching earrings are 1.25 inches long with 14K gold-filled ear wires. 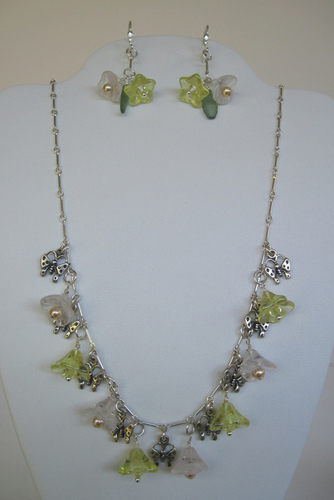 Priced separately, the necklace is $55.00 and the earrings are $25.00. This necklace features two strands of freshwater Keishi pearls with Swarovski Crystal accents. The rose pendant is Hill Tribe Fine Silver and measures 2 inches in diameter. It has a Sterling Silver lobster clasp. The price is $100.00. The pendant is wire wrapped in bronze. It measures about 2" by 1" wide. 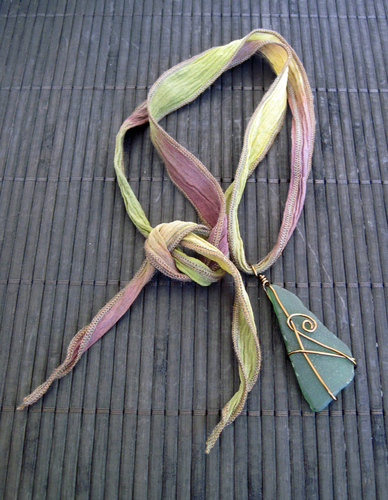 The pendant is hung on hand-died silk ribbon, which is about 32" long. The necklace is made with tiny sterling silver butterflies mixed with Czech glass flowers in yellow and pink. 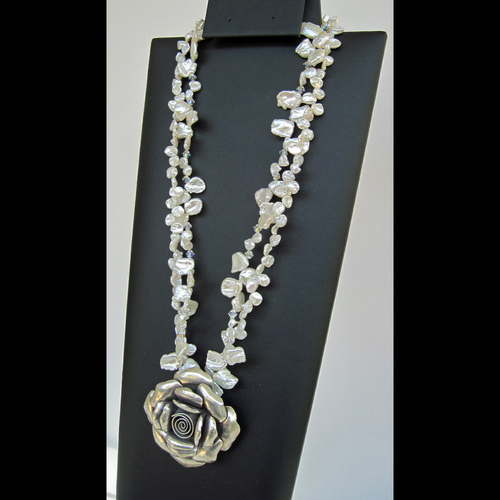 Each flower is enhanced with a Swarovski crystal or Swarovski pearl. 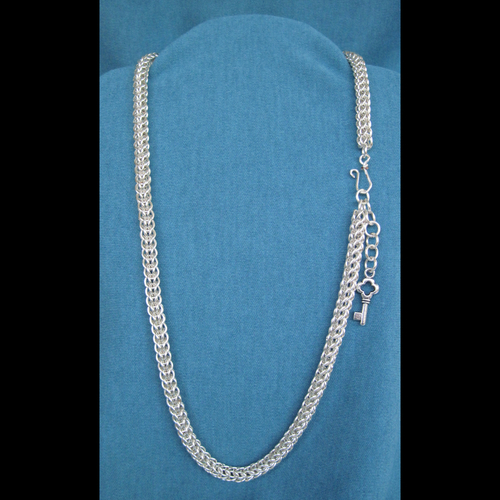 The sterling silver chain is about 21" long and has a sterling silver box clasp. 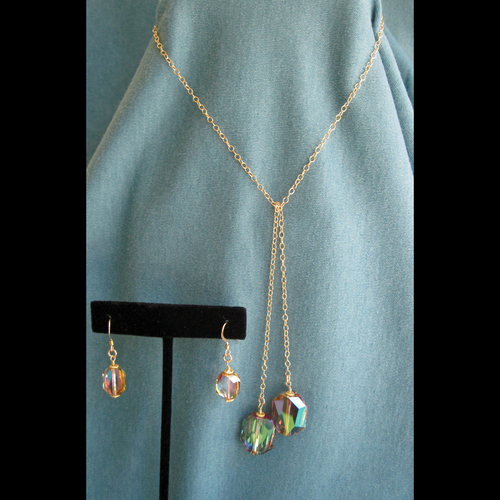 Priced separately, the necklace is $125, and the earrings are $25.00. 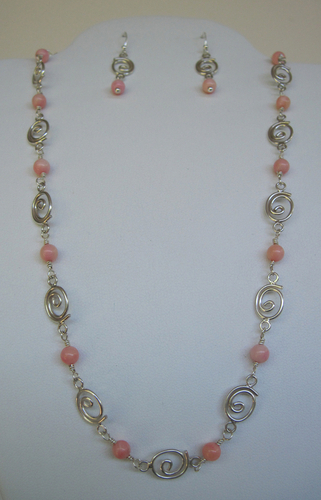 This delicate set is made with pale coral beads and sterling silver connectors. The necklace is about 18.5" long with a sterling silver lobster clasp. The earrings are about 1.5" long. Sold individually, the necklace is $80, and the earrings are $24. 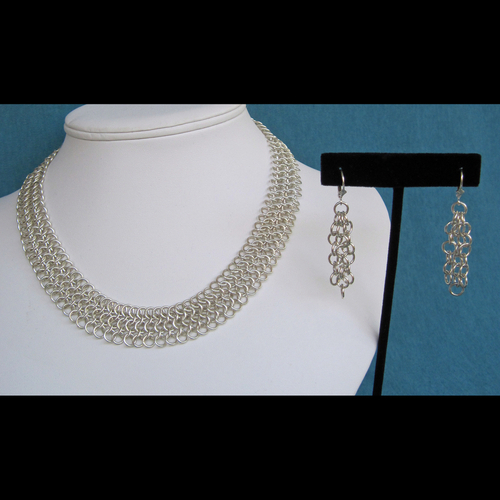 The necklace is sterling silver in the 4-in-1 chain maille pattern with Czech crystals. It is about 17" long and has a sterling silver slide clasp. The earrings are about 1.75" long with sterling silver ear wires. Sold separately, the necklace is $180 and the earrings are $25. 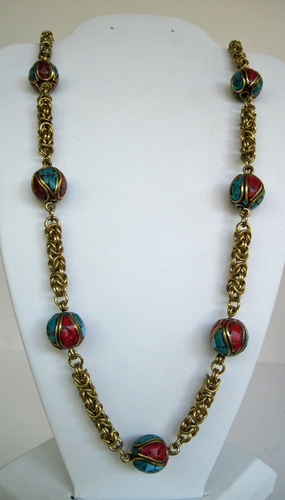 This unusual necklace is made with turquoise and coral beads set in brass and handmade in Tibet. They are connected by Byzantine chain maille, also in jeweler's brass. The necklace is about 26.5" long and has a brass hook and eye clasp. The necklace is made with 14K gold-filled and sterling silver circles in the Helm pattern. It is about 17" long and has a sterling silver lobster clasp. 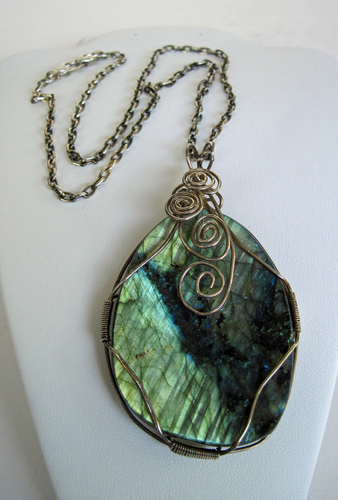 The necklace features a beautiful Labradorite pendant that measures 2.5" by 2" wide. It has been wire-wrapped in sterling silver and hung on a 25" long sterling silver chain, with a sterling silver lobster clasp. The necklace is made with charoite ovals and black metal spacers. It is about 22" long and has a pewter hook and eye clasp.